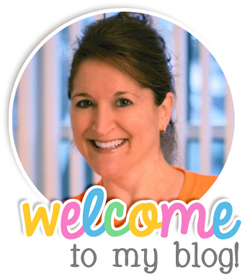 I know everyone has their own way of assigning jobs in their classroom, and, today, I'm going to tell you about my way. It's been working for me for many years and, each year, I give my leader of the day, more and more responsibility, which takes a lot of the pressure off of me. Since the leader of the day is in charge of all these tasks, and more, it frees me up to do other things. Even if it's just 2 minutes, that's still 2 valuable minutes for me to do something important, while someone else is in charge. I can check my email, file papers, clean up from an activity, get ready for the next activity, take a drink, or blow my nose. And, I can do these things without worrying about entertaining the children. Transitions have never been easier! Of course, it takes time to teach the children to be in charge. And I spend valuable time at the beginning of every year, training my students to take on these extra responsibilities. 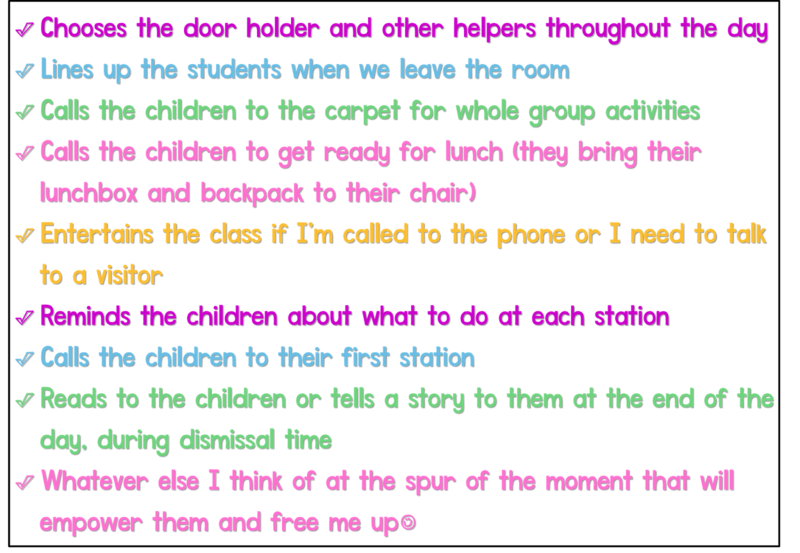 When a child is in charge and calling the shots, the rest of the class responds very well to them. The children really learn to respect each other and generally want to please each other and get noticed for their good behavior. Since I spend so much time role modeling how to be in charge, the children can't help but emulate my words and actions. 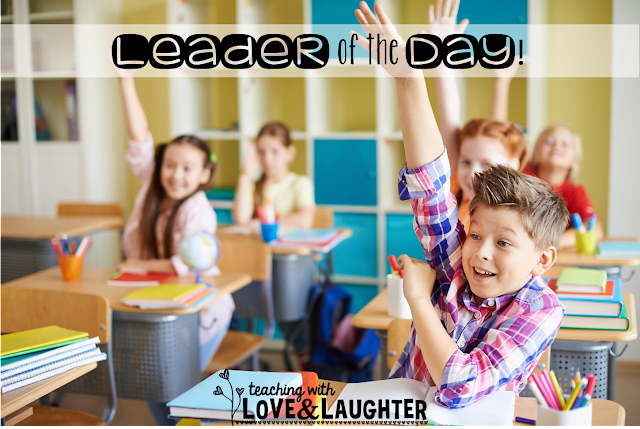 I often hear the leader complimenting their peers on their outstanding behavior and I see them smiling and winking at each other. Yup, even though I may be at my teacher table, writing a note, I'm always paying attention! So, there you have it! If you put your leader of the day in charge of more than just passing out papers and being a messenger, you will so enjoy all your free time! 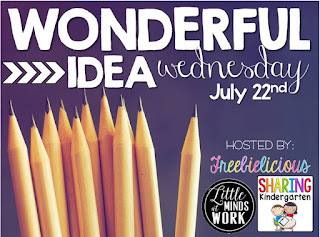 Now, head on over to Freebielicious and link up or read all the other wonderful ideas! Thank you for posting this!! 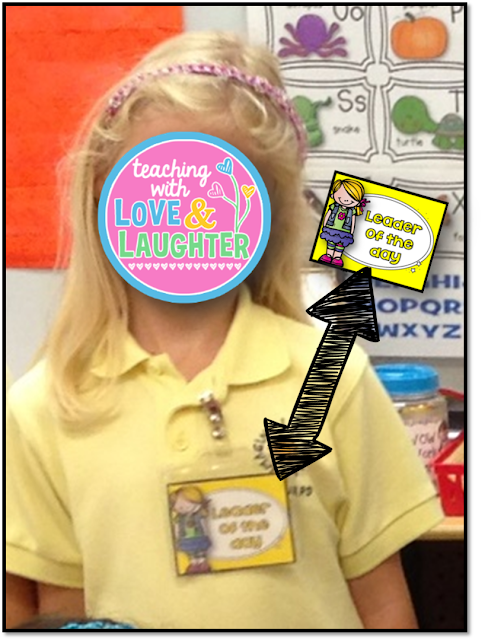 I haven't gotten a Leader of the day up and running since I came back to Kindergarten and I wanted to do it this year!!! Thank you for the ideas!! I love this idea! Do you have a copy of the badge? That would be wonderful! Shoot me an email and I'll send them to you, Josie! It is great to give children responsibilities. They need to own their education. I love your ideas. If possible can I get a copy of badges at tricia.k118@gmail.com. Thank you!! I would love a copy of the badge, if possible! katjor9902@gmail.com. I would like a copy of the badge too if I can please. This is great. Id like to start this idea too. Thank you. waljs@verizon.net Thank you. Can I have a copy of that badge please? I have been meaning to make one. Thanks so so much! Britany. hayesbn@pwcs.edu I love these ideas to add to my leader of the week. I can do leader of the day know.